Poochy Ain't Stupid is an Extra Level of World 1 in the game Super Mario World 2: Yoshi's Island and its remake Yoshi's Island: Super Mario Advance 3. It is unlocked by obtaining the maximum score (100 points) in all levels of World 1, not counting the Secret Level, Exercise in the Skies. The whole level centers around Poochy, and introduces a few new enemies not otherwise encountered in World 1. This level and KEEP MOVING!!!! are the only non-castle levels to have the castle music. 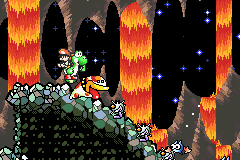 Poochy ferries Yoshi over a pool of lava. The player starts off in a cave area next to a Winged Cloud, if they go to the right some Fangs will spawn and the screen will start autoscrolling. 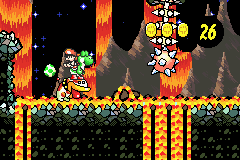 Not long after the screen starts scrolling there will be a lava pit that can only be crossed by using Poochy, who will be used for the rest of the level. When the player encounters the Bullet Bill they will need to jump up onto the platform and then drop down and land on Poochy who will then continue to ferry the player over the lava. After this, there will be a section with lots of Fangs and Tap-Taps, and after this will be another lava section that has a Spiked Ball rotating above it. After this lava segment, the player must blindly drop down and Flutter Jump to the goal roulette. In the SNES version, the player cannot land on a bonus slot to play the bonus game on the goal ring on this level. The wheel will stay on a win slot for as long as two seconds before advancing slots and less than a half second on a blue dot. Kono Baka Inu to Iwanaide Don't say "This stupid Dog"
French Bonjour la galère ! French expression that can be roughly translated as "What a hassle!" Qiān wàn bié shuō Bōqí bèn ó! Don't Say Poochy Is Stupid! This page was last edited on April 10, 2019, at 12:51.